I can hardly believe it, but starting on April 3, this hiker will begin tackling the entire Pacific Crest Trail in one continuous push. From the dusty outpost of Campo on the Mexican border, 50 miles east of San Diego, I’ll walk northbound through the wilds of California, Oregon and Washington. With a lot of sweat and toil and no small amount of good fortune, my plan is to walk across the Canadian boundary into Manning Park, British Columbia, sometime around Sept. 26. The PCT has been on my bucket list for a very long time; more than four decades, come to think of it. 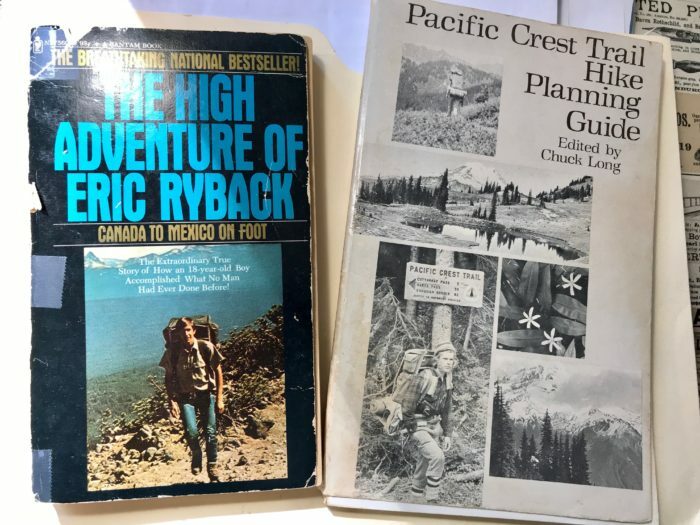 I first heard about the trail in the mid-1970s, when I picked up a copy of The High Adventure of Eric Ryback. In 1970, Ryback was the first person to hike the entire PCT, when the trail was largely incomplete. Yeah, yeah, there’s been a lot of hubbub over the years that Ryback skipped some of the PCT by hitchhiking, but nonetheless, his hike and his book got the PCT cemented into my brain. I read Ryback’s book dozens of times early on, carrying it religiously in my gym bag. That, along with Ed Garvey’s Appalachian Hiker, the all-important story of his 1970 AT thru-hike. Yep, I read that one a hundred times as well. It was the AT I had to do first and I knew it; I was a Mainer, after all. 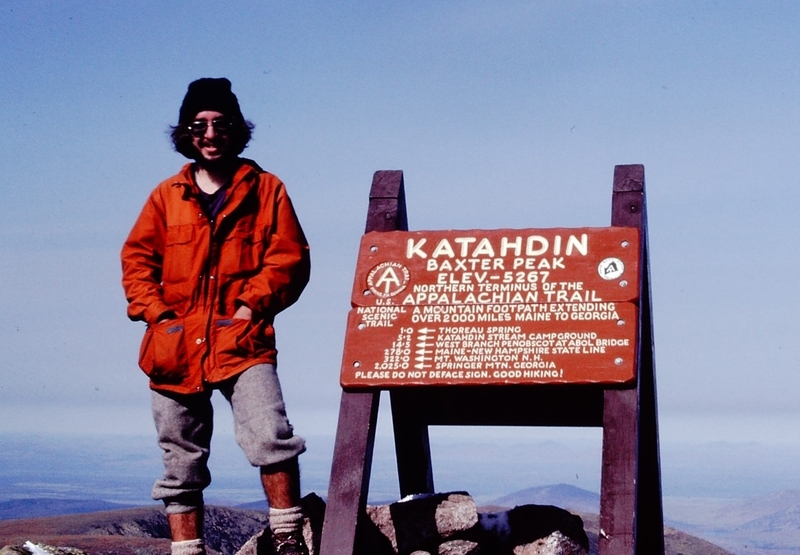 The AT’s Northern Terminus atop majestic Katahdin was right here in my backyard. Georgia to Maine; walking home it would be. I begged my way out of my senior year at Bangor High School in late April to go hike the AT. It was 1977. The principal, my teachers, and my parents all knew I’d be better off out there in the woods, crazy as the idea seemed, rather than doing not so well in the classroom (when I was actually there), with no plans at all for the future. I would go do the big hike and “get it out of my system,” they said to me and each other. It would “do me good.” Righto. I’d actually been planning to hike the AT ever since I was eight. That’s when I first discovered the AT on a family vacation to the Berkshires in Western Massachusetts. We took a drive to the top of Mount Greylock, and along the way the winding road crossed the AT several times. There were small brown and white signs at the roadside, and white blazes on trees along a trail that entered the woods on both sides of the road. My dad and I followed the blazes for a time into the mysterious forest. I’m not sure he’d ever heard of the AT before, and I know I sure hadn’t. Back at the road reading the sign, I was dumbfounded to think that this path went all the way to Georgia in one direction, and to Maine in the other direction. I was irrevocably hooked on the concept of walking the whole darn way. And that’s exactly what I did from early May to mid-October of—gulp—1977. Turns out I was something like the 250th person ever to hike the entire AT. Who knew? Hi all, Beerman here. I'm really psyched to be hiking the PCT in 2019, on the heels of the Florida Trail in 2017 and the AT in 2015 (and way back in 1977). At home on Maine coast right next door to Acadia National Park, I'm an outdoors and travel writer, author and editor, photographer, beer enthusiast, funmeister and husband to Fran, my #1 trail angel.